This rendering shows a proposed 85-foot cellphone tower that would be designed to look like a pine tree and fill in a gap in coverage inside a notorious dead zone north of Silverthorne. The notoriously poor cellphone coverage along Highway 9 between Silverthorne and the Green Mountain Reservoir could soon improve. The Lower Blue Planning Commission is scheduled for Feb. 7 to take up a new cellphone tower at 3175 Johnson Road, on a hillside above the Blue River Campground off of Highway 9, after receiving an application from a company that wants to build one up there. Maps showing cellphone coverage — or a lack thereof — speak for themselves, said Joe Oliver, site acquisition manager for Nexius Solutions, which is working as a consultant for AT&T on the project. “We got a big gray area and nobody’s getting service there,” he said. The tower is slated for a parcel of land about 6 miles north Silverthorne town limits, in an area where no other cellphone towers currently exist. For the Friends group, it’s been a long-standing initiative to improve coverage in the area known as a “black hole” for cellphones and this comes as “terrific” news. The tower will carry AT&T signals, but it’s being designed to house the equipment for up to three more service providers and 36 additional antennas. Oliver said he doesn’t know if other carriers will decide if co-locating on the tower is beneficial for them, but he hopes to have more carriers than just AT&T on the new tower once it’s built. 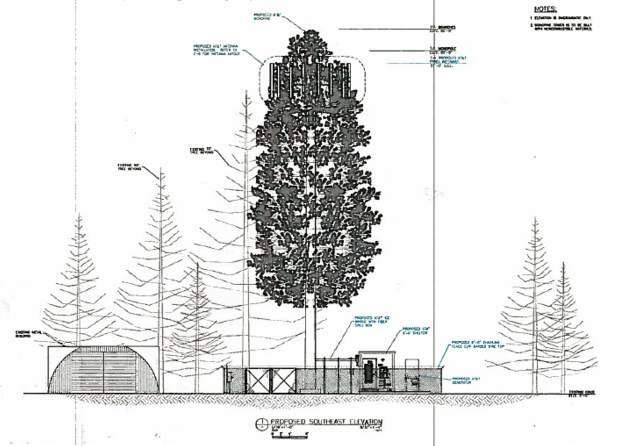 The permit application details an 85-foot “monopine” tower, which is one way of saying it will look like a pine tree. The height will be on par with nearby trees, which Oliver estimated at roughly 40-70 feet tall, and come with some small support buildings and equipment, neither of which should be visible from the highway. “You’re not going to notice it from Highway 9 for sure, unless you’re really looking for it,” Oliver said of the tower. According to the application, the neighbor most affected by the proposed tower has offered his consent for the project in addition to the support coming from the Friends of the Lower Blue River. Because there’s local support for it and because the project should bolster coverage in an area where “No Service” signals have led to safety concerns, Oliver is expecting few hiccups going through the approval process. In fact, an identical cellphone tower got the county’s approval in 2013, but it was never built and approval expired in 2015. Oliver said he doesn’t know why the original plan was abandoned. “I didn’t have the project back then so I can only venture to guess,” he said, adding it was probably a business decision on AT&T’s part. Because the project meets the county’s planning goals, runs in compliance with zoning regulations and comes with little to no impacts on the surrounding landscape, county staff has recommended approving the permit application. Oliver said AT&T is targeting the end of the year, but they could get the new tower up and running as early as sometime this summer. The planning commission will meet at 5:30 p.m. on Feb. 7 at Silverthorne Town Hall, 601 Center Circle. The commissioners will have final approval on the project, unless the their decision is appealed, in which case the appeal will go to the Summit Board of County Commissioners. Beyond the proposed tower north of Silverthorne, Oliver referenced a couple other efforts in the county that could bolster cellphone coverage as well. He said a new tower at the Summit County Resource Allocation Park should be operational soon, and he’s trying to scope out a potential location for a new rooftop tower somewhere in the Lake Dillon area.